HAL 9000 called and he wants his eye back! THIS looks like a ‘Fantastic 4’ movie I can get into! Magnus Robot Fighter 4000 A.D. laugh at girly man who need laser. World need Magnus Robot Fighter 4000 A.D. movie. Magnus Robot Fighter 4000 A.D. need work. Human wields chemical laser; giant robot only has bloody great claws. It seems there is a shortcoming to this security robot: It does not have a gun, and thus cannot shoot back at the intruder, only flail at him with its sharp claws. I smell a design flaw. Unless, of course, this robot was repurposed from the loading dock to serve as security. Which is very likely in this case. It’s not these guys that our heroic spaceman needs to worry about, but the giant bowling ball robot heading his way. @AR, 2: I thought that the blurb meant that you get to GIVE the robot menace a name. Like Virgil, or Stephanie, or something. What I want to know is, if this is 4, where are the other three? @DSWBT – #3 is dead on the ground, #2 is falling over and #1 is far off in the lower right. Considering how fast the right claw is moving, the spaceman soon won’t be around to deal with #5. OMG – Robotic Homer Simpson! PR man: We’ve changed your title. Author: But it’s about a planet that’s a junkyard. That’s not very cosmic. PR man: You want this published or not? @B’Mancer: Wouldn’t it be hilarious if they were 1, 2, 4 and 5, and the spaceman wasted time looking for a #3 that didn’t exist! 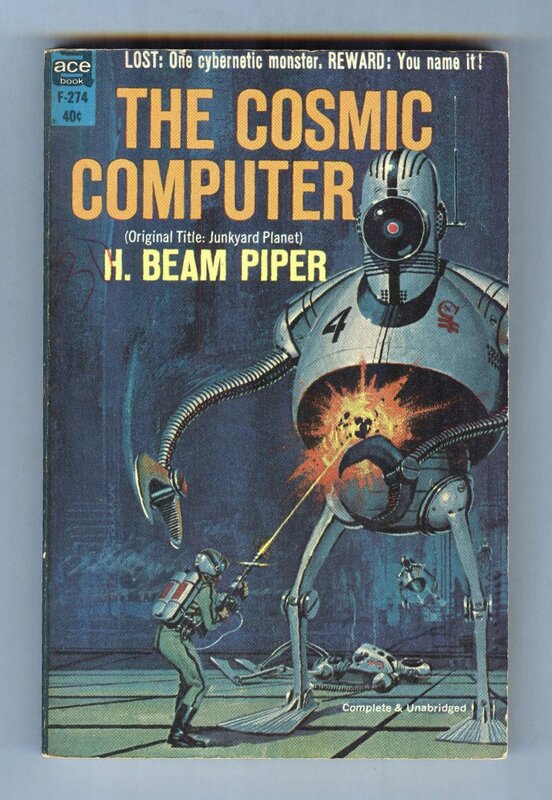 For a reward I’d like one of those H beam pipers as demonstrated on the cover, thanks. For my reward I want a laser that doesn’t make sad clown faces upon impact. @THX1138: Jamie claimed to have seen an H. Beam Piper, but he was delirious then and thankfully got better. Looking at the robot’s knees, a more effective weapon might be a gargantuan flathead screwdriver. Pow! right in the I/O! I LOVE Valigursky! Wish he would have been more prolific in Sci-Fi. So… Is this the original inspiration for the new Star Wars light saber? @Bibliomancer—why would the robots attack in reverse order? What do those numbers signify anyway? How did #3 manage to get himself killed before #4? Do you think #2 is falling over because those ridiculous fin feet don’t seem to bend? Who do you think designed their armor which, while providing the safest clavicles in the universe, leaves the vital midsection completely exposed? This has to be the the most challenged robot death squad ever to go out on patrol. @B.Chiclitz: Well, the design idea may have originally been that when the robot falls down, it can simply retract its legs to become egg-shaped, push itself upright with those weak, noodly arms and simply stand up again. Doesn’t seem like a particularly good choice, but hey, what do I know? And then some artist went and updated the design to make it look sleeker and more modern. So, now the model of the fallen robot on the background not only isn’t armored in the midriff but can’t get back up.